Sink Dimensions: 16.5" x 5.5"
Dimensions 28.0 In. X 20.0 In. X 10.0 In. You won't be disappointed. It is stunning! 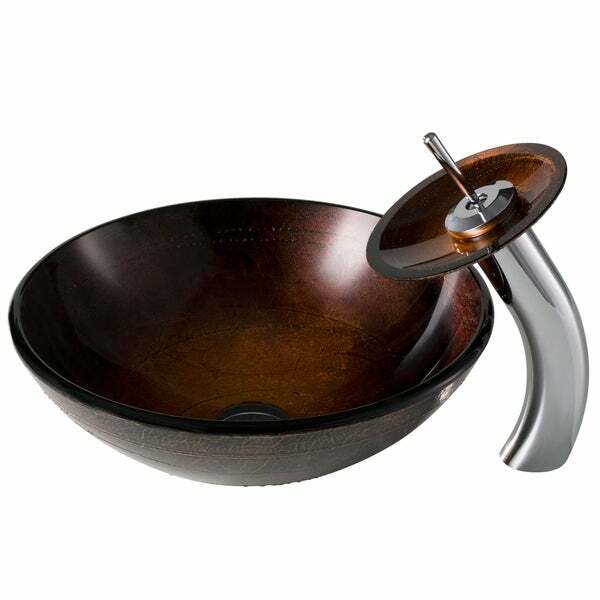 The faucet is gorgeous, the plate has a coppery bronze swirl design. The sink has swirls inside & outside. The pictures don't do it justice. You have to see if for yourself. It's one of a kind at a great price! These sinks are absolutely gorgeous. As stated in other reviews, they are more beautiful in person than pictured. I ordered 2 with satin nickel finishes and one bronze finish. The master bath has 2 sinks. After having a new granite countertop installed with the holes predrilled for the sink and faucets, I found that I now have so much more counter space than before. The guest bath has a single vanity, and now also has more space. Don't hesitate to purchase. One faucet plate was chipped, and a representative had a new replacement one overnighted in time for my plumber to install. Even the plumber was impressed with the quality of these sinks. The sink and faucet are excellent. The sink is very thick and sturdy. The was concerned about shipping a glass sink but there were no problems. The combination sink and faucet go exceedingly well together. This was an exceptional bargain. It is of excellent quality. Everyone is wowed by this. I was told that some vessel sinks don't drain very well. This one drains perfectly. I would buy this sink and faucet again.The waterfall faucet cascades the water beautifully. It's like having a fountain in your bathroom. Words and photos can't describe. It is a beautiful copper/brown/gold color. There is texture to the outside that reads into the bowl. (If that makes sense) The oil rubbed bronze faucet is more of a lighter color than what you would expect of the dark oil rubbed bronze. It still works beautifully with the dark oil rubbed bronze in the bathroom. One more thing, it is substantial both the faucet and the sink. My husband chose this sink for his bathroom remodel! He wanted something that would stand out in a very neutral bathroom! His walls are grey and his decor is black so the copper from this sink is the first thing you see! When I received the sink in, it was in perfect condition. Packed very well, and shipped quickly! We had to wait 2 weeks after getting it in to install it, as we were waiting for his custom cabinets to be finished. Once we got the cabinets in, the sink install was so easy! Took us 2 hours to install (and we are newbies to home renovations)! It looks beautiful, works great and is a welcome addition to any home remodel! Now the cons: I only have 1 complaint about this piece and it is easily remedied. The sink gets very spotty all the time. To combat the spots, I keep a bottle of Windex (the new kind that comes in a little press top bottle) behind the sink and leave a rag under the cabinet to wipe the sink out when it needs it! Very thick beautiful good quality sink came packaged perfectly. The faucet is definitely more orangey/copper than the photos. This sink and faucet are absolutely amazing and beautiful. Compared to others I have seen in stores the quality is excellent, the look is stunning and hte installation went very well. It operates beautifully. This sink is a show stopper! We ordered 2 of these sinks for our remodeled master bath. We are so pleased with the product! My husband installed them himself and found them to be the easiest sinks he has ever installed. The color and style fit our bathroom and make the entire room "pop". We would definitely recommend this product to anyone! This is the coolest part of our bathroom! It was easy to install, easy to clean, no problems with it. Everyone comments on how nice it looks with our Black Galaxy granite counter top in there. This sink and faucet are stunning. I bought two for my guest batroom remodel. I get compliments from every one who uses them. They are very formal. The faucet stream waterfall is perfect. I couldn't be happier with this purchase. I rarely write reviews but these were such a great buy I had to take the time. 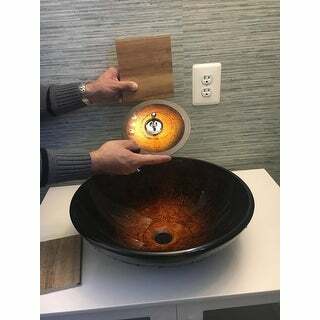 I ordered the ORB finish and it matches the colors of the sink perfectly. These really look like a piece of art. Very unique sink. Color looks copper in person. Get many compliments on it. Highly recommend for a unique look to your bathroom. safe fast shipping. Very high quality item. Love overstock! My teen daughter just loves her new vessel sink. Added to the top of a marble slab and it looks fabulous. The vessel sink met all my expectations and more. It was very sturdy and stylist. The color was very beautiful and had layers of color from the outer edge to the center. I was very surprised by the quality of this product. I would purchase from thus company again without hesitation. Great product! Nicely packaged, and good finish. I purchased for bathroom remodel due to Hurricane Harvey Demands. It was Nicely packed and arrived in time. I wish I had a finished picture at time of post, But still not fully finished. I love this sink, it is beautiful! The faucet on the other hand is very chinsty and delicate. I would suggest buying the sink on it's own and getting a different faucet. This turned out to be quite a show piece in our half bath. Was what I was looking for at a good price!! "what is the recommeded canity cabinet height (from floor to counter top)?" Thank you for contacting us qsca. Unfortunately we don't have the answer to this. We apologize for any inconvenience we might have caused.